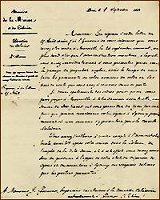 On September first 1863, Jules Garnier receives an answer to his letter of August 25, 1863 : the Ministry of Navy and Colonies on which he depends henceforth clarifies to him the terms of its orders, the details on its journey, its stopover in Sydney etc. 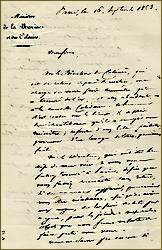 On September 28.1863 when Jacques alias Jules Garnier embarked in Marseille on the English steamer which carried to India and the Far East, the Mauritius and Australia the telegrams of Europe. On September 30 the boat put in Malta then reached Alexandria on October 4. Remembering his departure at the age of 27 towards the unknown (linked Photo) he writes: "This safety of journeys in steam passenger ships did not enter however for any account in determination with which I had accepted from the Minister : M. Marquis de Chasseloup-Laubat a mission of investigation to New Caledonia; even on the contrary, if I had had no hope to be in front of difficulties and of bigger dangers, it is likely that my adventurous mood would have diverted me from this undertaking; but I suspected, in this Oceania so little known, in the middle of its beautiful nature and of its man-eaters inhabitants, on this Pacific Ocean, so quiet or so terrible of which completely to satisfy the burning desire for fights, for new and varied studies which shook my imagination of twenty years." Thirty years after the publication of the story of exploration, Jules Garnier, in a new edition tells departure towards the adventure: "At the beginning of this century, a journey in Oceania was still very serious undertaking; them some glorified the spirit of those who dared to tempt the adventure, others blamed their boldness; as for the traveler, he had to have a heart of spartan for not weaken when all members of his family who thought of not seeing again any more, sent him their good-byes full of tears; but when, already in high tide, he did not see any more France than as a foggy line on the horizon, and, putting back his glances on his companions, he found only unknown, indifferent faces, hardened by a life of strain and danger, everything seemed to darken in his imagination; this motionless immensity , the sea, which did not leave with its vessel any moment of rest, did not stir up any more its admiration; he found the wave monotonous, the cold and wet breeze and if his pride had not spoken in a loud voice too much, he would have gladly exclaimed: "what did I came for in this galley" !